Fayston, Vermont. With Halloween a sugar coated memory, the Holiday Season is upon us. Be sure to include your dog(s) in the celebrations because not only are dogs good at cleaning up after dinner, they want to be with you no matter your to-do list. Thanksgiving probably means a family gathering, so I hope you’ll take a group photo with your dog. Remember to practice “Sit-Stay” before then, and be patient. Short training sessions done post-exercise and with consistency are the keys to success. Once you have everyone gathered, take several shots. Tip: Use the burst mode to take a bunch of shots quickly. You just need one with all eyes open. Before you go out for the photo with Santa, you want to both look festive. Many dogs are fine with costumes, but for some like my Charlie, a bandana is about all he will tolerate. Maybe he’ll wear reindog antlers. How did your dog do with Halloween? If he was uncomfortable or nervous, skip the costume. Bandanas come in just about any color and cost about $2 from the craft store. Or shop Etsy for a holiday-themed one just for dogs. I’ve put reversible bandanas from Simply B Vermont (on Etsy and at The Quirky Pet in Montpelier, Vermont) on my crew as they are handmade near my house and come in a variety of super fun prints. They cost $16 each. For you, dress in coordinating colors. Solid colors photograph better than patterns, but ugly sweater is your call. One of my favorite finds this year are the holiday animal sweaters for women at Lands’ End. Probably not ugly enough to win an office contest, but they offer one with a Golden Retriever, another with a cute terrier, and one with a Dachshund, as well as a variety of other designs (cat, sheep, cow, plus traditional seasonal motifs). Made from machine washable cotton; $69.95 – 40% off with coupon code NOVEMBER40 as of this writing. Basic commands “sit”, “stay”, and “come” are essential for safety and everyone’s enjoyment. Work on these often! Use a leash and harness and whatever reward system you prefer. Make sure your dog is healthy and vaccinations are up to date. Practice! Take your dog to stores that allow pets. Make the outings short at first. Many shops on Church Street in Burlington, Vermont are pet friendly. Some of the big box stores are dog-friendly, too. Call ahead if you’re not sure. Caveat: In preparing this article, I started by searching those pet friendly guide websites, but found some information not accurate or out of date when I confirmed with the businesses. So before you go, call your destination directly to inquire about its pet policy. Exercise your dog before any practice runs and especially before the Santa trip. Public outings are not for every dog. If your dog seems anxious while you’re waiting in line, leave. If your dog is nervous or the slightest bit reactive, don’t even try a store outing – have a friend come over to take your photo. And keep working with your dog on socialization. Check your local community calendar for holiday events that are dog-friendly. PetCo and PetSmart locations across the country will offer Photos with Santa in December. PetCo in Vermont will host Santa on December 8 and again on December 15. PetSmart in Williston, Vermont expects to host Santa on every December Saturday before Christmas. After Thanksgiving, call your local store or look online for times and dates. Shop Small Sale at Dog Mountain Home of the Stephen Huneck Gallery, St. Johnsbury, Vermont; Saturday, November 24. Ok, not a night out, but a great opportunity to pick up unique gifts. You may bring your dog. Ugly Sweater Contest to benefit Golden Huggs Rescue, Wednesday, December 19, Prohibition Pig, Waterbury, Vermont. The food was terrific last year! Details are still forthcoming – I’ll post an update with complete information next month, or check Prohibition Pig’s website in the coming weeks. A bigger selection of my cards is available at Product Think Tank in Waitsfield, Vermont (in the Mad River Green Shopping Center, next to the Post Office). This dog-friendly boutique is home to locally designed Mountain Lifestyle natural fiber sweaters for men and women, with styles and colors for all the adults on your gift list. Please stop in to take a look. Bonus: Benefit Contest For Dogs And Their People – Enter Today! Going on now until November 30, the Orange Crush social media contest from Spot The Dog Vermont is a fun way to play outside during stick season. It is hunting season here in Vermont, and Spot The Dog Vermont makes hi-viz orange vests and bandanas for country dogs. We’ve bought the vests for all three of my dogs. Charlie also has a bandana that’s plaid with reflective dots on one side and orange on the other. This event benefits Golden Huggs Rescue, from where we adopted all three of my dogs. Spot the Dog was founded to save dogs lives by protecting them during hunting season, on the trail, and at night. Spot the Dog has a DEEP commitment to saving rescue dogs by contributing 10% of every sale we make to Golden Huggs Rescue. The Spot the Dog orange crush campaign is about having fun and SAVING LIVES! Beginning Saturday Nov 10th (rifle season kick off in VT) Spot the Dog will be posting photos of your “Orange Crushes” – your dog, a rescue dog, any dog that you love decked out in safety orange! At the end of the contest (runs until December 10th) whichever “Orange Crush” received the most cumulative likes (Instagram+Facebook) will receive a LIFETIME supply of new Spot the Dog safety wear and have a $3000 check donated in the winner’s name to Golden Huggs Rescue! 3. Wait to see your photo pop up on our page, and in the meantime share and like our Orange Crushes!! Our weather went from fall to winter practically overnight. Most days, Linus has taken up his spot in front of the wood stove while Charlie and Lucy sit in the snow on a hill in our yard, watching. I don’t know what they’re watching, but they seem to know their job. In an image sent in by Carol, Bradley the Labrador (owned by Carol’s son) enjoys a dip in a lake in the Sawtooth Mountains. Fayston, Vermont. After a couple of posts giving photography tips for capturing a good portrait of your dog, I put my readers to the test. (Well, it was an optional assignment.) I received excellent submissions through which I can not only see your dogs likeness, but I also feel how special your dogs are. That emotion is the end goal of a good portrait, so congratulate yourselves on an assignment well done! From Carol, in New Jersey, I received images of of her son’s dog, Bradley, and of her Labradoodle, Wilson. Kersten, also in New Jersey, shared photos of her dog Rhodie. Andrea in Connecticut sent in photos of her dog, Filbert. And Nancy, who lives not far from me in Vermont, forwarded photos of several of her dogs. Thank you all for sharing your images! I’ve assembled the photos into a gallery, below. Click on an image to see the dog’s name or owner. Sweet! Fayston, Vermont. Still struggling with taking a decent photo of your dog? To follow up on my post from May 7, 2017, Picture Perfect: Tips for Taking Dog Portraits, here’s a simple exercise to start you on your way to taking better dog portraits. Yes, a little homework – it is back-to-school time – then, please send your assignment photos to wagmorevt.com and I’ll post them next month. The assignment theme: “Let sleeping dogs lie”. I heard from some of you that your dog just won’t sit still long enough for you to take a decent photo. Training tips aside, let’s remove the action bit as much as possible and start with a tired pooch. Step 1: Take your dog for a good walk. The light will be best for photos in the early (early-ish) morning or early evening, so time your walk with your mission. Tidbit from Captain Obvious: Pick a day that’s not raining or about to rain. You want good light. Wet dog is your call. Step 2: When your dog settles down for a post-walk rest, take out your camera or smart phone. Hopefully your dog will be some place where you will have natural light, like through a window or outside on your deck. Turn on your camera or the camera on your phone. Charlie Brown does not like mornings. To take this shot, I steadied my smart phone on the deck while I crouched super low, almost lying down, to take the shot. Step 4: Take the picture! Take several pictures: Try different angles, like above and below your dog, and take multiple shots. Try moving in very close for just the face, then farther away for the whole dog. Linus rests after his morning walk, Note how the soft light coming through the windows hits his face from the right side and behind him. Step 5: Edit your image. Simply using the auto-enhance feature in iPhoto (or whatever you have) is often all you need. If you still have a lot of shadows, move the shadows slider in iPhoto to the right to lighten the shadows. Use the brilliance slider to lighten up dark photos, too. Cropping unnecessary bits will help your composition by “focusing” the attention on your subject. Step 6: Send your finished image to wagmorevt.com! I’d love to see them, and I’ll share them in next month’s post. Please tell me your dog’s name, your name, and where you took the shot (town, state, and then anything else – living room, under the bed…) Your deadline for inclusion in the next post is Sunday, October 1, 2017. Have fun!!! And, happy snapping! Lucy, Charlie Brown, and Linus sit for a portrait outside my front door. This “welcome mat” was shot using my iPhone. This post is written in response to the requests I’ve received for tips on photographing dogs. Photography, in general, is subject about which A LOT has been written, so I’m going to hit on quick and simple ideas that I’ve found useful with my dogs. I’ll “focus” on these areas: dog wrangling, light, composition, equipment, and editing for taking dog portraits. Linus is staring at the treat in my hand. Ths “stay” command allows a few seconds to focus and press the shutter a few times so I can choose the image I want. Yes, Linus enjoyed the treat! Use basic commands of “sit,” “stay” and “come” when taking dog photos. Photo sessions double as training sessions! I have noticed an improvement in my dogs’ response to “stay” since I’ve been taking more frequent squad photos. When Linus sees the camera, he will sit before I even give the command. Reward and praise – and be patient. Charlie on a foggy morning walk. I liked the mystery created by the fog but had to lighten up the image with editing to see Charlie a bit better. Consider what you’re trying to shoot then find the right light. I prefer natural light, whether outside or inside next to a window. Early morning and late afternoon provide better light than full sun midday when shadows will be strong and could make your image striped or dappled. If the sun is bright, move into the shade for even light and no squinting. Shade on a light-colored sidewalk or on sand will yield more true colors than shade cast by bushes on the grass, which will give a greenish cast. Bright light will better define the action at high shutter speeds for action shots. Fog and mist create drama. Generally, you will need more light to photograph a dark colored dog like my Charlie Brown than you will need for a light colored dog like Lucy or Linus. Linus, giving me the eye. Black & white shows texture well. Also, note the circular (triangular?) composition of the dog’s body around the shadow. Optional exercise: Try converting your images to black and white and discover the lessons in contrast and texture to be learned from black and white photography. Also, experiment with apps (some of my favorites are listed under the equipment heading) and their settings and filters to figure out what you like the best in your images. 3. Composition, or how the viewer’s eye moves around the image, is another topic too broad for this post to really cover well. That said, the viewer’s eye will be attracted to the lightest spot (usually), so pick a focal point that is light, such as the eyes. Before you start, think about what emotion you’re trying to show or what the story is you’re telling – your focus, so to speak. Also, take the time to look at your surroundings with your photo in mind. An uncluttered background puts the attention on your subject for a classic portrait. If you are shooting a landscape, have your dog be the focal point for an interesting composition. For a basic portrait, focus on the dog’s eyes. Shoot with the camera at dog-eye level. This tip is also useful when shooting human subjects. Also, try holding the camera lower than your subject or directly above for a different view – play with the angles! Lucy poses during a recent walk in the woods. I called her name to get her attention as I hit the shutter. She was above me on a rock ledge so I could stand when I shot the image. This was shot with my iPhone. Hold a treat behind or above the lens so the dogs look directly into the camera. Or make a noise to attract their attention to you, behind the camera, for a view of the subject’s face. Profile or 3/4 views also make lovely portraits, so please don’t think there is only one right way. Photos of paws, or a nose, or even a tongue tell a story about personality. Pay attention to shadows and reflections – they can really enhance your composition or detract by fighting for attention with your subject. 4. Equipment: Smartphones work just fine! Use what you have, and learn how to use it. If you’re like me, the camera always in your pocket is your smartphone. The newer smartphones have good cameras, so invest a little time in learning how to use the camera and take advantage of the extra features available with apps. While my Canon 7D DSLR takes awesome photos, it’s not always convenient to carry. I tend to leave it at home when I go out on a hike and use my iPhone. Remember, with a smartphone’s camera on (or open), tap on the area you want to be in focus. 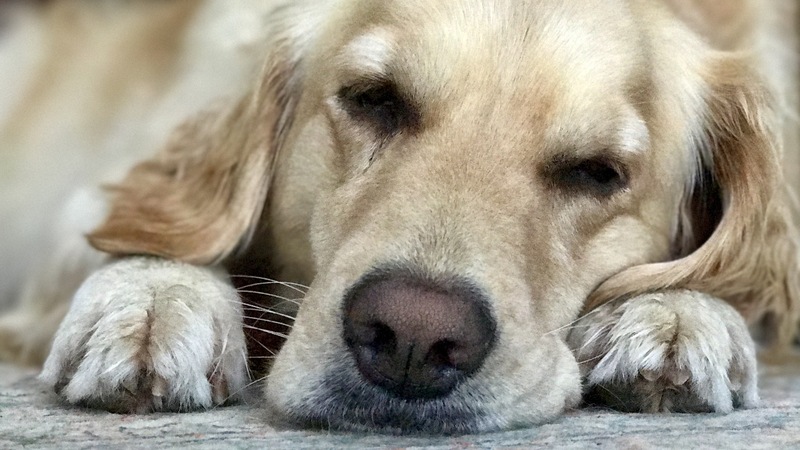 The smartphone camera will want to focus on the closest object, which on a dog’s face is the nose, so tapping on the eyes on the screen will tell the camera otherwise. With a few apps, shutter speed and aperture can be set to better control a smartphone’s camera. These two sets of photography numbers do two different things. Lucy is frozen in mid-air by setting my iPhone’s shutter speed to 1/1000 using the CameraPlus Pro app. The morning was dark, so the image is dark, even after editing. Shutter speed: the larger the number, the crisper – or more frozen – the action will be. 1/1000 freezes Lucy’s hair mid-leap. A setting this high works best in bright light. Aperture: Or the f-stop number; the smaller the number (portraits), the more blurry the background will be. The larger the number, the more will be in focus (landscapes). Start with setting either the shutter speed or the aperture leaving whichever you don’t choose on “auto” until you become more comfortable with the settings. Steady the camera. Make yourself into a tripod: Decrease camera-shake by holding or leaning on something as you hit the shutter or putting your camera on something. Make sure your setting for stabilization is “on.” Exhale as you hit the shutter. Some of my favorite apps for my iPhone include Camera Pro Plus (costs a few dollars, but it’s great for setting shutter speed and easy editing), Slow Shutter (for low light and long exposures), and PicsArt (great for adding text or fun filters). I also use Photoshop. 5. Editing apps can really make a difference between a good image and a great one, and apps only take a few seconds to use. While editing tools cannot un-blur a blurry image, they can improve lighting, lighten up shadows, boost color, remove unwanted objects or even the entire background, and crop to improve the composition. Filters on apps can change the mood with a single tap. Charlie Brown focuses on the treat. I’ve focused the camera on his eyes to better show his expression. This was shot with my Canon 7D. 6. Have fun! The most important thing is to have fun with your dog. During training time, have your camera handy but keep the sessions short. If you want a big family portrait, practice often with your dog before you gather the people. Take a walk, and take some photos along the way. Your dog will love the walk – and the extra attention – and you’ll be taking wonderful photos to show off your beloved pooch!